This is a subscription article. Oregon preview, UCLA review, and… Kickers! On a Podcast. 25 minutes of podcasting perfection. Did I say perfection? I meant, uh, something else. Every football fan knows the following frustration: Your team is up by a score or two mid-way through the 4th quarter. It’s time to grind out the clock. Problem is, your opponent KNOWS you’re trying to grind out the clock. So do you run plays that don’t keep the clock rolling so that the defense is confused or do you accept that you’re likely going to go 3 and out? It’s a big risk to not run out the clock in the traditional fashion because the defense may think you might run some plays that won’t run out the clock because they know you know that they’re going to run out the clock. Previously, the game clock stopped when a runner went out of bounds and didn’t re-start until the next snap. The proposed change will make an out-of-bounds play just like a first down, after which the clock is started when the official marks the ball ready for play. But the clock will not start until the snap during the final two minutes of each half to protect the two-minute offenses. When most people, and I think coaches fit in this group, read this rule change, they blocked out of their mind the running out the clock aspect of this rule change because of the two-minute caveat. The two-minute caveat “feels” like ‘the end of the game’. But the reality is that when you’re running out the clock, it can start WAY before there are two minutes left. Often times the final two minutes are the last of 3 or 4 drives of running out the clock that started early in the 4th quarter. I believe this perception provides a good opportunity for the rule-savy coach who appreciates this. Defenses focus on stopping the run up the middle when their battling a run out the clock offense. They assume that the offense isn’t going to run around the edges because it’s the traditional wisdom that edge plays tend to go out of bounds and the clock stops. True, the clock does stop, which adds to the perception that the rules haven’t changed, but it only stops for the 10 or so seconds it takes the refs to spot the ball. 30 of the 40 seconds there are between plays the clock is still rolling. So, watch for this late in the games from now on and watch for the coaches who are running, quite successfully, on the perimeter. And watch for how the clock keeps ticking (once it is set by the ref). As always the podcast is free to the public. Of course the COF has no money and so will not pay. But it at least means that they’ll cease to exist as the organization because they couldn’t do any fund-raising without having to give that money to the University. But the rest of the money will get paid and I think it’s really important, particularly for the PHA as it’ll really discourage future legal action when they’ve got no case. This will no doubt not sit well with them. Also remember that the appeal is still in progress. While the appellate judge refused to put an injunction in place while the appeal is heard, which allowed the University to move forward with the project in the mean time, the appeal will still be heard and could, in theory at least, halt the project if the appellate court ruled in favor of the Petitioners. Right now, they’re still in the formative part of the case with the Petitioners being asked to show cause for why the appeal should move forward (a normal part of the process). I’ll give updates when the action gets rolling. This is not the site for nasty trash talking. If you want to do that, go to one of the many over the top message boards. On this site, only reasonable analysis is welcome. Slightly biased analysis, including commentary on why you think the Ducks will win, is fine, but it should be supported by reasonable arguments. *Funny thing about that 24 points he was complaining about, it turned out to be the final score for the Ducks last year. There’s no need for that type of stuff and it is not welcome here. Please keep your comments respectful (and that goes for Cal fans too, although most who come here regularly have been reminded of that before). So welcome Duck fans! I’m glad you visited… but please keep the commentary respectful. 2002, no game: The potential best match up of the year gets the shaft in the 8-game Pac-10 schedule, delaying the start of what has been a great series. Thankfully, the Pac-10 shortly resolved this problem by going to a full 9-game round-robin just a few years later. 2003, turn out the lights: Cal came into this game 5-5 after destroying the Arizona schools in back to back weeks. Oregon was 5-4 having just got drubbed by U-Dub. Cal played a strong first half but could only squeak out a 10-7 halftime lead. However, in the 2nd half, the team came alive and was up 17-7 and was driving to score again when 1/2 of the stadium lights went out. Yes, you read that right, 1/2 the lights went out. It took them close to a half-hour to get the lights back on and when they did, the Bears couldn’t recover, eventually losing 17-21, capped by an Oregon touchdown with less than a minute left. 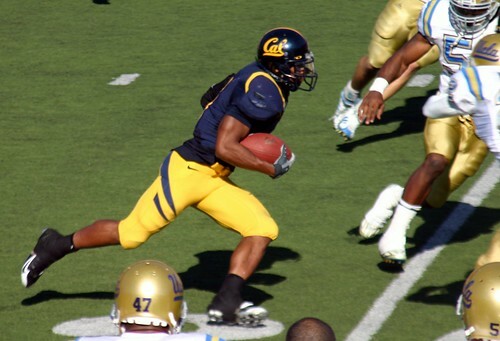 2004, hands of stone: Unlike the previous year, Cal was a BIG favorite in this game, ranked #4 in the country. Their only loss was to #1 ranked USC in LA in what was perhaps the most thrilling game of the 2004 Pac-10 season. Oregon on the other hand was having a more mediocre season at 5-4 (again). However, it was Oregon who attempted to return the favor of Cal’s tough play the year before taking a 27-14 lead in the 2nd quarter, their only mistake being a missed extra-point. However, being a day-game, the Bears had to find a different bag of tricks to use to rebound than the Ducks. Aaron Rodgers got his groove back and the defense made strides against the Oregon offense, finally taking the lead back early in the 4th quarter, 28-27, the missed extra-point now being of critical importance. It all came down to the last Oregon drive of the game where with less than 2 minutes left when a wide open Keith Allen dropped a pass on 4th down. The catch would have both kept the drive alive and put the Ducks well within field-goal range. 2005, going backwards to kick hurried field-goal: The tables had turned on the two teams in 2005 with Oregon 7-1 with their only loss being to USC and Cal in a free-fall after starting the season 5-0 and now 6-2 after barely escaping Berkeley with a win over ailing WSU. It was a back and forth game where Ayoob shot himself in the foot numerous times preventing Cal from dominating. It setup the critical juncture of the game with the scored tied at 20-20 where Cal had the ball and drove all the way to the Oregon 33, marginal field-goal range with one timeout and just under a minute left. However, Cal lost ground on both 1st and 2nd down pushing them back to the 44, well out of field-goal range. To add injury to insult, Cal had to use their last timeout on the 2nd down busted play. Cal needed a 10+ yard play that stopped the clock to allow for a field-goal attempt. Instead Ayoob ran the ball to the Oregon 37 and went down in-bounds setuping up a 20-second scramble to get off a 54 yard field goal attempt in the rain. The kick was short by less than a yard, a kick that would have been good from the original 33-yard spot. Cal then lost in overtime. 2006, the exception that proves the rule: This was SUPPOSED to be the next in the line of great games, this time between two ranked teams. However, Cal’s defensive pressure proved too much for the relatively inexperienced Dixon who made a number of mistakes including an early game interception in his own redzone that set the tone of the game in this blowout. 2007, fumble for a touchback: Probably the best game of the series, two undefeated teams and highly ranked teams met in Eugene, along with the ESPN GameDay crew, for what was a a battle for the ages. After trailing for most of the game, albeit by one score at the most, Cal put together a handful of good drives as the defense came up with some critical stops mid-2nd half to take a 31-24 lead. Oregon tried to come back but a handful of turnovers in the 4th quarter stiffled their otherwise good progress. It all came down to the last drive yet again with Oregon down by 7 with 1st and goal after a long drive down the field. When Colvin reached for the endzone on a quick pass to the outside, he was hit REALLY hard by Ezeff, who managed to somehow knock the ball out of Colvin’s hands. What was particularly odd about it was that the ball didn’t go the direction of the hit, but squirted forward into the endzone and out of bounds for a touchback, sealing the win for the Bears. What’s going to happen this year? UPDATE: My prediction for the unusual thing that tips the scales this year is special teams. Between Belloti’s penchant for the trick play on special teams, Cal’s uneasiness in some special teams situations while at the same time having some pretty big run back potential, I think this year there is going to be a late-game special teams disaster for one of the two programs that will end up being the deciding factor. 60% likelihood of a blocked punt, 30% likelihood of a big run-back, 10% likelihood of a fumble on a runback. That’s not a criticism, that’s an actual question. Never in my years of following Tedford has his decision making process been so unpredictable to me. I FULLY expected Longshore to start this week. The order in which the two tooks snaps in practice was very similar to how they took snaps before Longshore’s other starts, at least early in the week. So what is Tedford thinking? I think the right answer is that nobody knows… and he likes it that way. 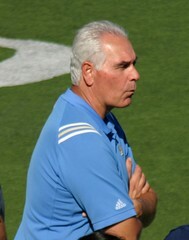 UCLA defensive line: At the weekly press-conference Tedford talked about picking the QB based on the “game plan”. Well, what if the “game plan” includes recognizing that UCLA is going to try and bring a lot of rushing heat via their studly interior defensive linemen? Well, if you’re worried about that, you’re much more likely to pick your more mobile quarterback, someone who’s more likely to still make a play even after getting heat. Home games are easier for inexperienced QB’s: Perhaps the reason that Longshore got the start versus Arizona was because he wanted a QB who had a lot of experience for a road game. Now that the team was back home in their comfort zone, Tedford felt more comfortable playing the younger Riley. The problem with this theory is that Longshore started the Colorado State game, which was a home game. Riley was replaced to get some ‘perspective’: This theory is that Riley has been the starter all along in principle but Tedford decided that Riley needed to take a step back before he got to scatter-brained with the pressures of starting every week. Instead, you take him aside and say “OK, we’re gong to give you a couple weeks off to work on your fundamentals and get back in the groove.” This theory doesn’t feel right, but perhaps, if you combine it with the road game theory and change this one slightly to say it retroactively, that Riley DID improve after getting a week to re-group, that Tedford thought, I want to get this guy back under center, but I want to do it at home. Unspoken injuries: There’s a lot of possibilities here. Perhaps Riley had an injury that the coaching staff didn’t communicate. Perhaps it’s quite the opposite and it is Longshore who’s nagging back injury or leg injuries that weren’t communicated but have been suspected that was the reason for the decision. So which is it? Only Tedford knows. Perhaps it is something entirely different. All I know is that this is not the same Tedford who stuck with his QB for all of 2007 even as he was hurting very badly. As I said up front, nobody knows what he’s thinking and I think that’s the way he likes it. Neuheisel curiously called timeouts after each of the Bears’ three kneeldowns in the final seconds, forcing Cal to run a handful of running plays. I can sort of understand the first two timeouts, but when Cal got the first down, there was no way for them to get the ball back. Still, Neuheisel called time out. Can anyone explain? Finally, a moment of silence for Towel Man (right). It’s true — he’s sad not just because Cal beat UCLA by 21, but because Rick Neuheisel took away his towel. Is there no tradition in Westwood? I read on the Wikipedia that Towel Man retired in January and moved back to central California. I wonder if this game was Towel Man’s one appearance on a UCLA sideline this year. If so, Towel Man, we salute you. Towel Man wouldn’t have called all those timeouts. A beautiful day, and Cal in their best uniforms as well. I thought Riley played quite well, especially in managing the game and using his mobility to get out of the way of blockers (as on the big flea-flicker pass). 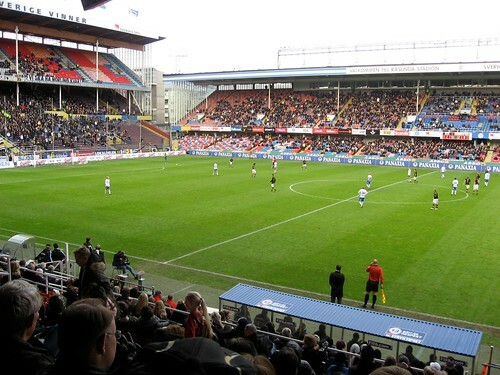 For reference, the crowd was much larger (though not much louder) than the one at the match I attended the previous Saturday — in Stockholm. But they had one thing in common. The home team won, both times. Often when one talks about ‘controling one’s own destiny’ in football, they talk about it late in the season and generally when only one team has it. And while that’s a good scenario to talk about it, mid-season we often forget when we talk about it that it’s possible for more than one team to control their own destiny. Oregon State: With their one loss coming to Stanford, another team with two conference losses, they also control their destiny. Of the two other 1-loss teams, USC needs someone to beat Oregon State to get back in control. The two likely candidates for that are Cal and Oregon. Oregon needs someone to beat USC. The likely candidate for that is Cal, if anyone can do it. 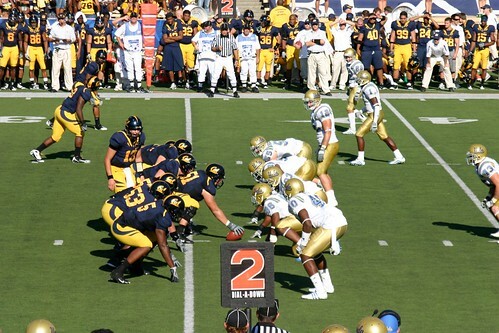 Both teams have Cal on their calendar in the next two weeks and before Cal plays the opponent they need them to beat. So what they’re hoping for is to beat Cal, but to do it in a way that doesn’t kill their confidence when they face the team they need Cal to beat. Is it just me, or is this all very fascinating? Of course, the other way to look at this is the way nobody is looking at it. People aren’t looking at it this way because Cal has two games in between now and then that they’re likely to lose at least one of. Nevertheless, as of right now, November 15th is the day and Corvalis is the place where the two teams that control their destiny will meet to fight it out for the singular title of ‘control of their own destiny’. In the end what this all means is that the next three weeks will decide the fate of the Bears. Right now, everything from the Rose Bowl to the Hawaii Bowl is still up for grabs for the Bears. By the time November 16th rolls around, it should be pretty clear where the Bears are headed. This is a bit late, but for those who didn’t know, the Oregon game will be on ABC at 12:30 (on 11/1) like many expected. Here’s the release. 11/15 OSU decision 11/3 ABC @ 12:30 or FSN @ 7:15 or ? 11/22 Big Game ? ? That just leaves the OSU game which has a couple options and the mysterious Big Game which seems to have no options and no activity on a pick-up by CSN-West. There’s got to be something going on behind the scenes there. Otherwise every other game for the 2008 season will be picked up on TV. I spent last night reviewing the Arizona game footage with a specific emphasis on why Arizona was able to run the ball on the edges. I had intended to go all high-tech and get screen captures a la HydroTech over at CGB. But technical difficulties (Slingbox and Tivo, why must you torture me so!) slowed me up enough I couldn’t follow through on that. My memory of the game was that the Bears did a good job of stopping the run between the tackles but failed on the perimeter. Not so! While the the consistency of success in the middle was not as good as it was around the edge, a lot of the big runs where up the middle. The blocking schemes that Arizona threw at the Bears didn’t work often, but when they did, it was HUGE. Add in a bunch of missed tackles that allowed the run game to work more consistently than it should have up the middle and the run game was surprisingly balanced inside and outside. A lot of longtime football fans have been surprised at what Cal is calling the 3-4 as in most of the plays it looks a lot more like a 5-2 with both outside linebackers all the way up on the line of scrimmage. Most of the time, the ‘traditional’ 3-4 had the outside linebackers about half-way between the line of scrimmage and where the inside linebackers were lined up. There were a lot more snaps where Cal’s 3-4 looked a lot more like the ‘traditional’ 3-4 against Arizona, particularly on passing downs or when Arizona went 4 or 5 wide. While I didn’t notice a very dependable correlation between when Arizona had success running on the edges and when Cal was in the ‘traditional’ 3-4 (it was hard with not many examples to work with) it did seem like Cal struggled in that formation. This was one of the more distressing things I saw. Usually Cal’s corners have been pretty good about at least holding their ground against the blocks of wide-receivers, if not great at getting off of them and forcing the play back inside to the line-backers who were in pursuit to crush the runner. 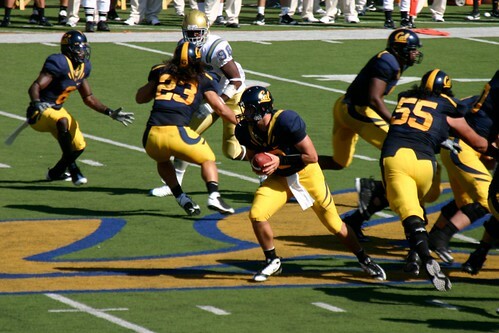 However, Arizona’s wide-receivers OWNED Cal’s corners, particularly Hagan and Conte on Saturday. There were a bunch of plays where they could have disrupted things or prevented the majority of the gain, but because they were effectively on their backs watching, there was running room both inside and outside of their position. This is the most difficult to explain and why I left it for last. The holes in the line where the running-back runs through are called the ‘gaps’. The A gap is between the center and the guard. The B gap is between the guard and the tackle. The C gap is between the tackle and the tight-end (or receiver if there’s no tight-end). In cases where there is a tight-end, the D gap is outside of them. In the 3-4, normally the nose-guard has responsibility for both A gaps (one on either side of the center). The defensive ends are responsible for the B and C gaps and the outside linebacker covers the D gap, or in other words, the outside linebacker covers the perimeter/outside/edge. However, I said “normally” above for a reason. Often times there are ‘stunts’ (really too strong a word here because there are no crossing defensive linemen) where everyone shifts to one side to overload that side. The nose-guard takes the A gap, the end the B gap and the outside linebacker the C gap, putting more people in the gaps on one side than the offense is expecting to have to block. While I didn’t have the time to analyze how many of the instances where Cal got burned on the outside was a planned ‘stunt’ or whether it was just a case of the linebacker jumping inside when they shouldn’t have, it doesn’t change the fact that what happened was the linebacker purposely jumped into the C gap and there was no pursuit from the inside linebacker or safety to take the outside, giving Arizona the edge for a big gain. This in my opinion was the main cause of the issues. We’ve heard it said before by the coaching staff that the defense sometimes bites too hard inside and doesn’t play their assignment to protect the edge. There was a ton of this against Arizona, with the outside linebacker, particularly Eddie Young, jumping in the C gap to try and get to the running back in the back field and giving up the edge, leading to a big run. Hopefully they can get this cleaned up by tomorrow. Well, I’m back to my bad habit of taking almost a week to get up my post-game podcast. I’ll try to get back on track this Sunday with another prompt one after the UCLA game. In any case, here’s the Arizona addition, recorded on the LONG trip home from Tuscon (don’t worry, the podcast isn’t as long as the trip). As with all of the podcasts over there, they’re all non-subscription articles and free to all. As an FYI, I’m still working on putting together my On The Road Home podcast from the Arizona game. It’ll have audio quotes from the coaches and players as well as my normal commentary. I’ll go up tomorrow morning. Finally, a shoutout to California Golden Blogs writer ragnarok who went on the road trip to Arizona with me. He made the trip a lot more enjoyable, particularly what would have been a REALLY long drive home after the loss and cut my gas costs in half. Thanks for coming along rag! It is a subscription article. You’ll likely see a second article posted over at BearTerrtiroy.net later today that I wrote last night.